I absolutely love this picture. 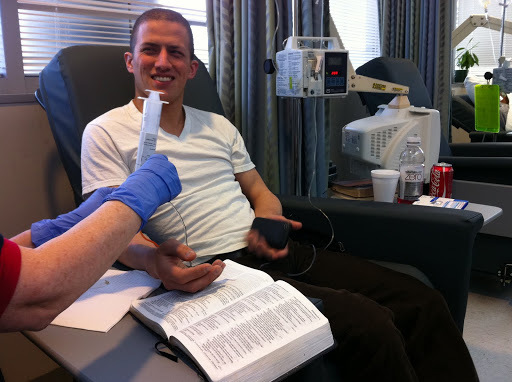 This was taken during our friend, Hunter’s, last chemotherapy treatment today. It is a picture of the joy that Hunter has found in the midst of the greatest hardship of his life: Hodkins Disease (cancer). This picture tells so much of the story. A cheerful spirit during a terrifying season of life. His Bible has become his road map that led him to peace in the midst of uncertainty. We celebrate with Hunter today the completion of his treatments and the fact that the doctors have declared him cancer free. Praise God! The next step will be to undergo radiation in the coming months to ensure this cancer doesn’t come back. Chemotherapy ends today. Radiation begins in a few weeks. And joy is found in Jesus along every step of the way.